Would you like to taste the health-giving grain found in the tomb of King Tutankhamun? Or feast on the unprocessed kernels said to have been stored on the ark by Noah? Or how about a vodka made from traditionally farmed Bolivian quinoa? If any of this whets your appetite, you are not alone. There is no comprehensive list of “ancient” grains, but the category is generally agreed to include amaranth, barley, bulgur, buckwheat, kamut, millet, spelt, teff and quinoa. 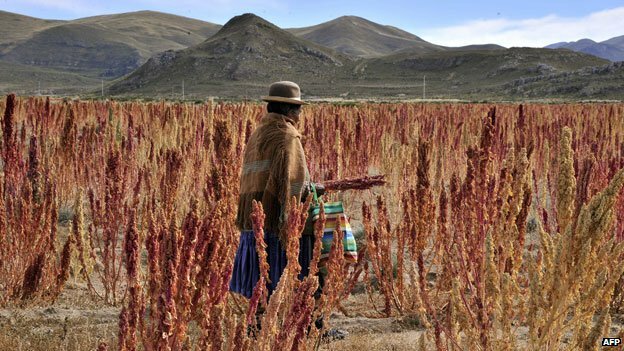 Many of these grains – Bolivian quinoa and Ethiopian teff, for example – have been planted and harvested in the same way for thousands of years. “It’s been a positive perfect storm for these ancient grains,” says Cynthia Harriman, director of food and nutritional strategies at the non-profit organisation, the Whole Grain Council. “They fit with our desire to look for a super-food, a magic bullet we should be eating,” she says. Ancient grains are perceived as the opposite of modern wheat, which is the descendant of three ancient strains of wheat – spelt, einkorn and emmer – and often heavily refined. They are seen as more healthy, more natural and better for us, providing more vitamins, minerals, fibre and protein than modern wheat – partly because they are rarely eaten in processed form. Continue reading via BBC News – Why do Americans love ancient grains?. This entry was posted in SCIENCE AND NATURE and tagged food, North America. Bookmark the permalink. ← Art on the Streets of New York City.